I always need to find a new recipe for our Gourmet lunch and my turn this time was starters. One of the challenges is that the starter needs to be relatively light as we serve several courses, the other challenge is that it has to be the first time one makes the dish, so it is always an experiment. I decided to make a soufflé style filling for large field mushrooms. 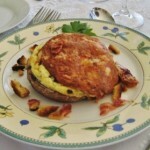 Firstly the mushroom base is light to eat and the soufflé filling is also fairly light. 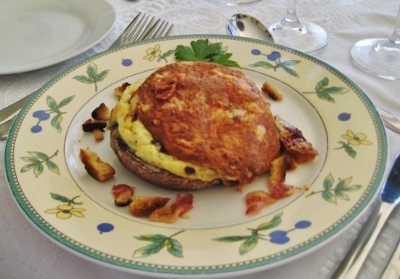 The secret is to use large field mushrooms with high sides which curl in a bit, forming a wall, as this helps the soufflé to rise, if the mushrooms are too flat the filling spills out and does not rise much (as I found out) but it still tastes good. It is also important to get the right temperature otherwise it does not rise. I used a lot of garlic in the sauce which makes it nice and pungent, almost truffly in flavour. I sprinkled small croutons and crumbly bacon bits over the mushrooms which is not essential but adds an interesting saltiness to it. One advantage of the sauce is that it can be made the day before, then kept refrigerated until the dish is assembled. I paired it with the St Cosme Cotes-du-Rhone Rouge as it has a delicious earthiness which complements the flavours in this dish. Remove stalks from mushrooms and chop the stalks small. Fry chopped garlic in bacon fat (or olive oil) until lightly golden, add chopped mushroom stalks and cook gently until tender. Cut butter in small chunks and gently melt in a heavy based saucepan. Pour in all the flour in one go, use a wooden spoon to mix together well. Return to heat and cook gently for a few minutes until light gold in colour stirring all the time. Remove from heat and pour in the milk all at once, stir briskly with a wooden spoon until blended and return to heat. Fry the baguette slices in olive oil until golden brown and crisp. Add the egg yolks one at a time into the bechamel sauce, beating in well with a wooden spoon. Whisk the egg whites in a separate bowl until stiff, then slowly mix into the sauce with a spatula, lifting the mixture high to get as much air as possible. Spoon the mixture into the mushroom caps until about 2/3 full. Sprinkle the other half of the grated cheese over the mixture. Bake in the oven for 20 – 30 minutes until the soufflees have risen and are firm to touch. Once the mushroom soufflees are cooked, place one on each plate, sprinkle the croutons and bacon bits over and around the mushrooms and decorate with a sprig of parsley. Serve straight away as the soufflee sinks quickly. I recommend that you serve these mushrooms with a glass of St Cosme Cotes-du-Rhone wine.